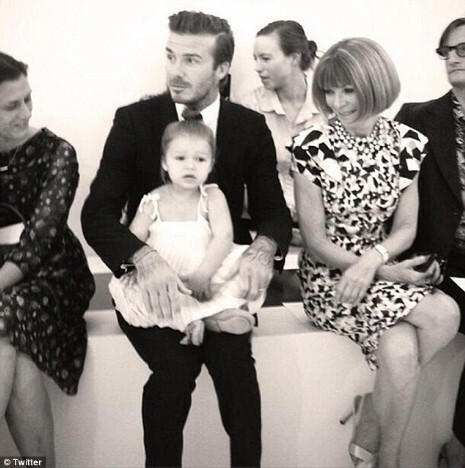 Anna Wintour might not be interested in having Miley Cyrus as a cover girl, but she certainly has her eye on Harper Beckham – perhaps as a cover girl in a few years! They just happened to sit next to each other at Victoria Beckham’sFashion Week runway show and Anna was so enchanted she cracked a rare smile. The well dressed 2 year old sat patiently on her father’s lap and behaved throughout the event. Harper probably DOES have a future in the magazine. Vogue posted the photo on Instagram.